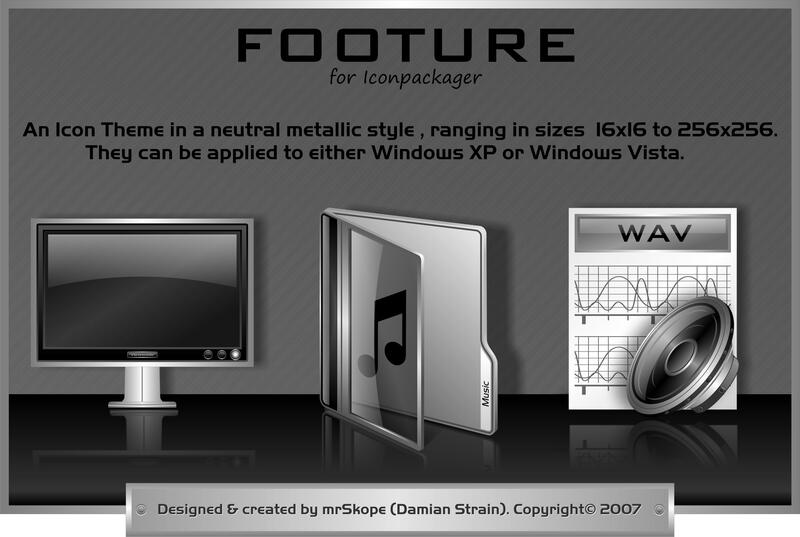 This my new theme called Footure, info is in the preview. There is a lot of transparency in this set so they may not be a readable on dark backgrounds. The theme contains around 124 icons, including duplicates and sizes range from 16x16 to 256x256. They can be applied to Windows XP or Vista. One thing to note is that i'm unsure about the live folder previews, so i have left them out until I come across a tut/guide on that. Anyhoo...comments welcome good and bad and i hope you all enjoy the theme. I've made some tweaks here an there, changed the folder style and added the lve folders. Thank you I.R.Brainiac ..just wondering, is it only WIP or can finished stuff be put up there too? you have such a great style Mr.Skope! Thanks but i noticed you said from 16 to 256 but when i open the .icl in iconworkshop mine only show up to 128 and not 256 and some icons have 2 different icons in the one. And its not just 1 or 2 it seems to be quite a few. Has anyone else noticed this or can confirm this as well. The Icons look awesome! Is there a color version? Excellent icon set. Can't wait until you can do the live folder previews. These would look great in colors. I tried to colour them in ID but didnt work. I'll maybe mess around in corelDRAW an see how it turns out. I have the same problem in my new icontheme. thx,it's really nice,haha~i like it! How do I download Icons?